The media is demonizing Donald Trump over a tweet in which he blamed migrants for the rise of crime in Germany by claiming he’s lying, but Trump is largely correct. “The people of Germany are turning against their leadership as migration is rocking the already tenuous Berlin coalition. Crime in Germany is way up. Big mistake made all over Europe in allowing millions of people in who have so strongly and violently changed their culture!” tweeted Trump. This was an obvious attempt to suggest that Germany has not experienced any ill effects in terms of crime as a result of importing around 2 million migrants since 2015. However, the NY Times is completely misleading its readers in an attempt to smear Trump. While overall crime in Germany is down, violent crime is significantly up – and the vast majority of that rise can be attributed to migrants. In addition, new figures recently released by the German Federal Criminal Police Office (BKA) show that there were 39,096 German victims of immigrant crime in 2017, a new high. This compares with 31,597 the previous year, a rise of 23.7 per cent. Another study carried out by the Zurich University of Applied Sciences found that migrants are responsible for a 92% increase in reported violent crimes in Germany during 2015 and 2016. 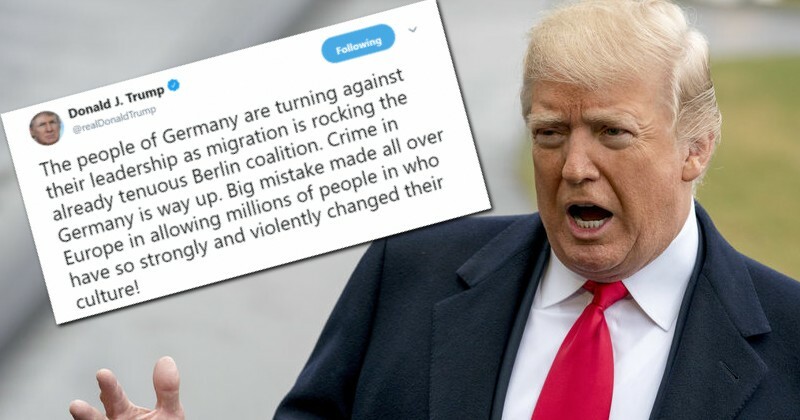 Trump is completely correct in his broader point that mass immigration has caused huge crime and social problems in Germany, which is why Angela Merkel could be on her way out. Trump’s only mistake was to exclude the word “violent” from before the word “crime” in his tweet. His wider point that migrants have “violently” changed the culture of Germany is totally accurate and backed up by credible studies and government statistics.